Can you name a typical Catalan dish? Perhaps not. Next time you head to Barcelona or the Costa Brava, make sure try one. 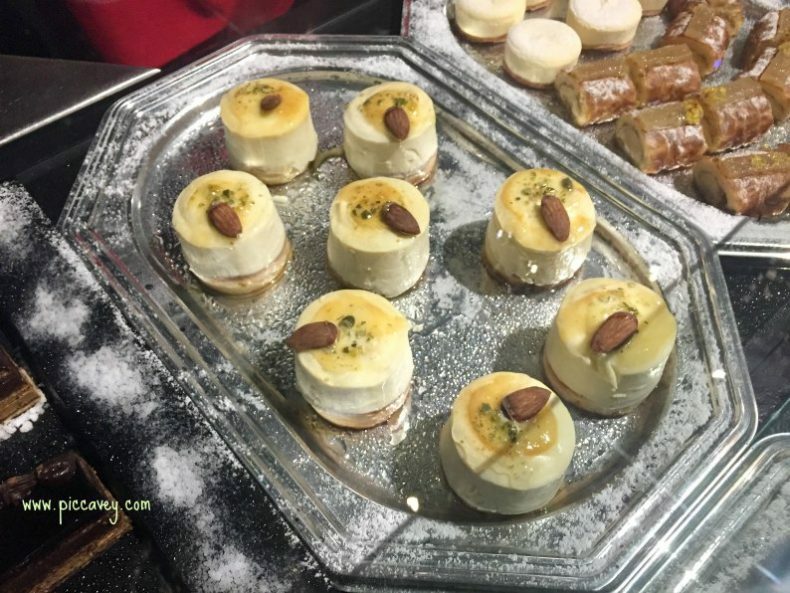 Typical Catalan food covers a wide range of dishes like Calçots (Scallions) Romesco sauce or Escalibada (slow roasted vegetables) Panellets (Almond sweets) Crema Catalana (like crème brulee) and Carquiñolis (similar to biscotti) are typical sweets in Catalonia. One of the best dessert I have tried is Mel i Mato. A fresh local cheese made from cow or goat’s milk. Served with local honey. Simple but special. Mar i muntanya, dishes which mix meat and fish in the same recipe are typical in the region. Such as chicken and prawn dishes. Some recipes are highly complex however others are quite simple using just one or two ingredients but high on flavour. The history of Catalan cuisine has evolved over the centuries particularly by Phoenician and Roman influences. As they introduced Olive Oil and wine to the region. The main staples in Catalan food are fish, meat, potatoes, vegetables, wine and olive oil. Since living in Barcelona for 8 years and my recent visit to Opera Samfaina I have learnt more about Catalan food culture. Opera Samfaina is on the Ramblas, right in Central Barcelona. Through the experience you see Catalan Cuisine right up close. I didn´t realise what an extravaganza I was actually letting myself in for as I headed through the door. 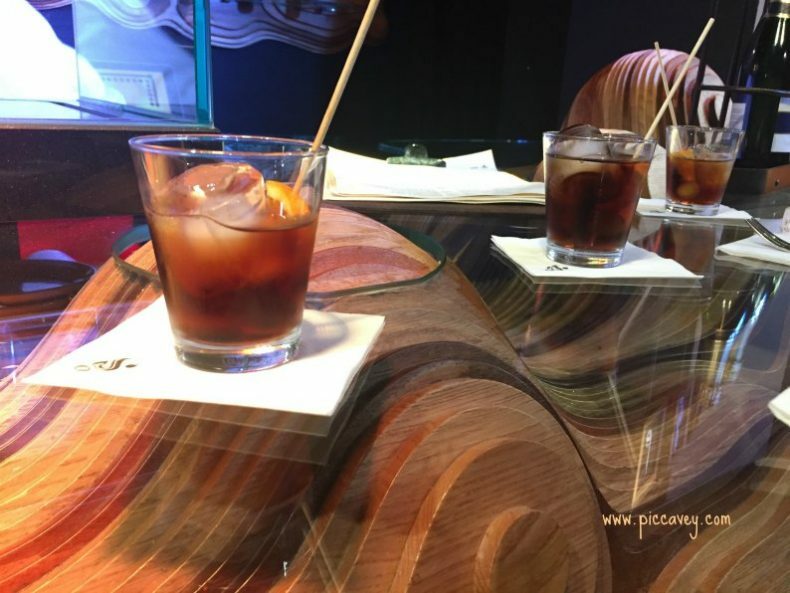 Greeted with waiters in local dress, the lobby bar welcomed us with a vermut. The interior design was contemporary and stylish. So far so good. Vermut has been made in Catalonia for over a hundred years, similar to Martini, this red fortified wine is offered before a meal, to whet your apetite. After tasting a small aperitif of Russian Salad and drinking the vermut, we headed downstairs in the main area of Opera Samfaina. A large circular table set with a tray for each diner awaited was set. The group was around 10-12 people, but the table could seat more. 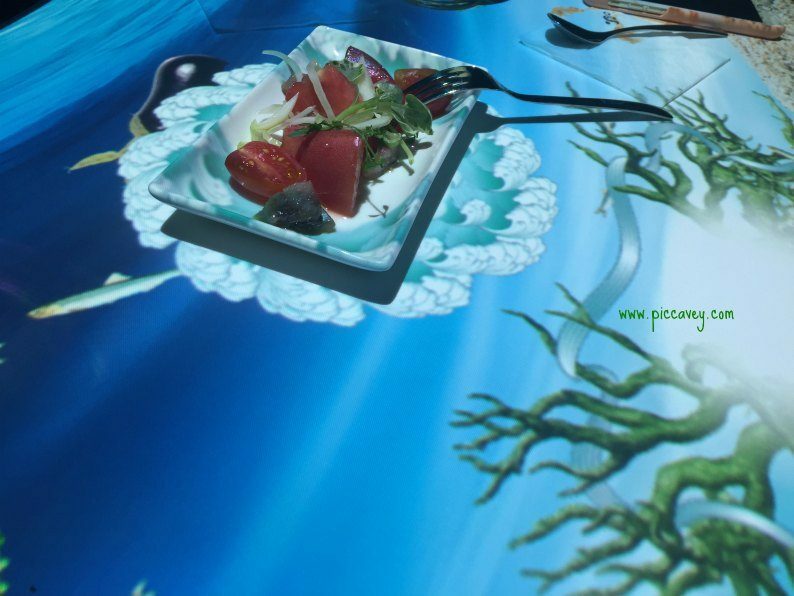 This enormous table was actually a huge screen projecting images and animations throughout our experience. Here we discovered the story of Catalan food culture. Each part of the story ended with the tasting of one of the foods set out in front of us. I listened to the multimedia show in English, however they also offer it in Spanish or Catalan at different times. 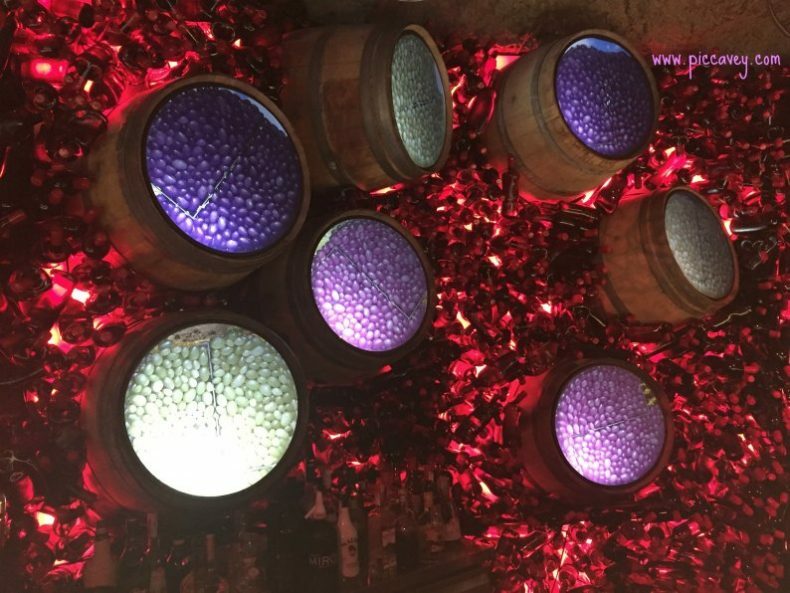 A fun look at how Catalan cuisine has evolved over the years, this show uses many dozens of projectors to tell the story. 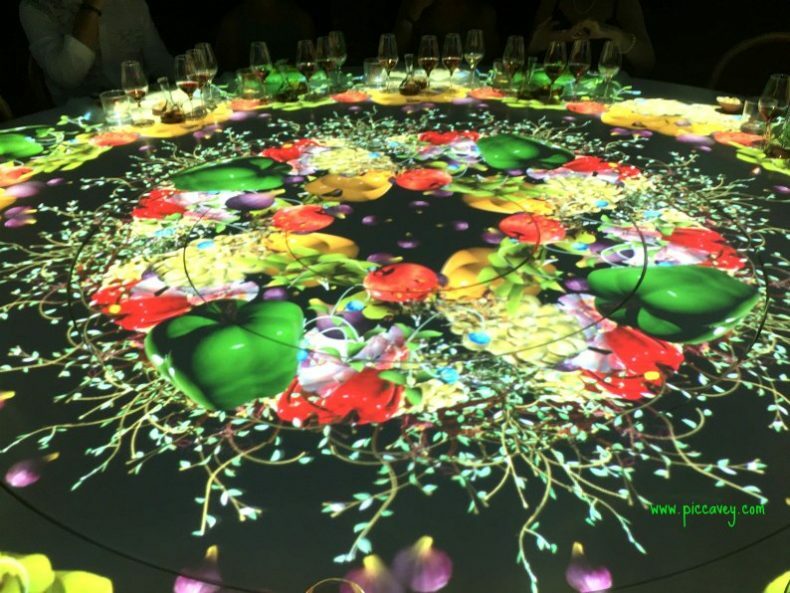 You look up to the large screen, down to the table creating kaledescope style formations and then to your food and wine before you. A glass of wine is paired with each food. Selected and arranged from dry to sweet the wines complement the foods we taste. Escalibada, fire roasted aubergines, peppers and onions is typical in Catalonia. A simple but delicious way of serving vegetables. Here we taste it on a cracker with red wine. Other food in this session included Salted anchovies from the coast, local cheese, olives and some slices of cold meats. Pa amb tomaquet couldn’t be missed off. Rubbing the tomato on crusty white bread with local olive oil is so simple but such an important custom in Catalonia. After the amazing storytelling experience we moved out of the room into another space. A tunnel decorated with different scenes from the story. These scenes are highly intricate like museum pieces, some sculptures and others were graphic art covering the space linking one area to the next. In the next area the bar was a horseshoe shape. 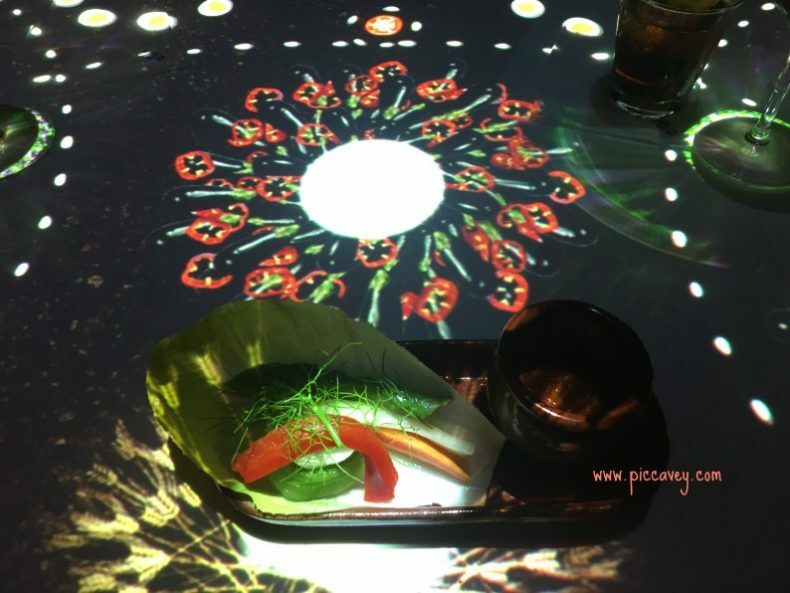 The surface also had projections which were related to the food we ate. The surprising and enchanting thing about this place is that there are atmospheres to suit different styles. If you want to talk quietly over a few apertifs with good wine there are some spaces on one side. Also if you are looking for a full blown culinary extravaganza then also have it ready for you. Just pop in for a sweet wine and dessert there is actually a dedicated dessert bar. (Sheer Heaven IMHO) There is even a funfair style room where you can try the typical Porron or wine bottle or even see what a caganer does. The Caganer is a typical Catalan figure usually seen at Christmastime. He appears in the nativity scenes. Years ago there was a legend that if you didnt include a figure in the Christmas nativity that the following year the vegetable harvest would be poor. The pooping figure is a symbol of good fortune and fertility. So of course Opera Samfaina embrace this legend and have a full scale Caganer in one of their rooms. The good thing is that he ´poops´ fine chocolate which you can actually eat. 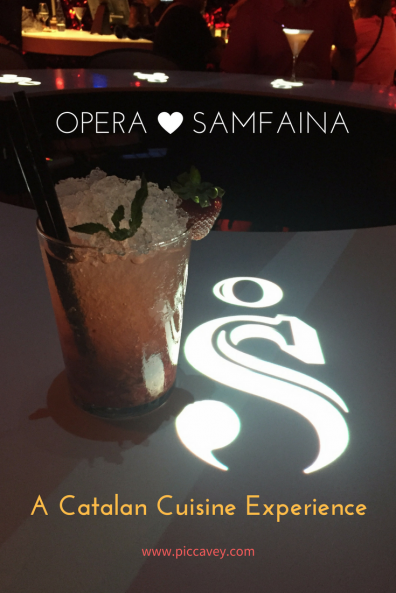 Opera Samfaina is not a restaurant, it really is an experience. They manage to combine interiors, cuisine and culture in a unique atmosphere right in the centre of the city. To me it´s the Willy Wonka of Restaurants. As if they threw all their creativity into this project with no limitations. Even the bathroom was impressive. 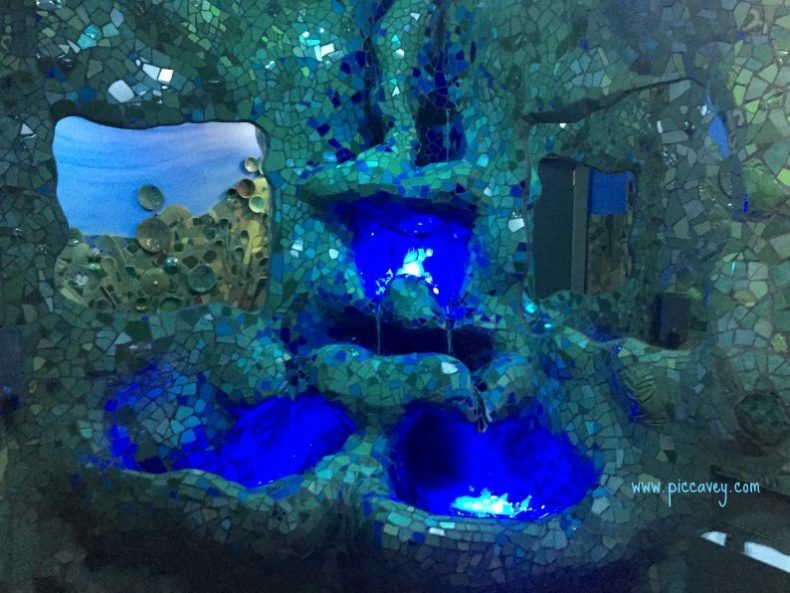 Instead of just your normal sink they have recreated the fountain at Parc Guell. The whole bathroom was decorated in green and blue trencadis tiling. Clearly inspired by Gaudi, a catalan architect, it´s clear to see that no stone is left unturned here. Creativity floods literally into every corner of Opera Samfaina. Along the walls are cups and saucers as well as the tile mosaics. Also the toilets are gold and it´s fits in so well with the atmosphere of the restaurant. Can you imagine… a restaurant than has chairs on the ceiling and plates in the bathroom? You maybe wondering who is behind all of this creation. You may have heard of El Celler de Can Roca, Girona, this restarant was named the Best Restaurant in the world in 2013 and currently holds three michelin stars. The brothers Joan, Josep and Jordi Roca behind the Celler de Can Roca also created this concept of Opera Samfaina. Finally, even the floor is colourful. I can highly recommend this experience whether you live in Barcelona or only visiting. I booked the Odyssey + Diva menu €58 as I wanted the full experience. There are other packages and prices. 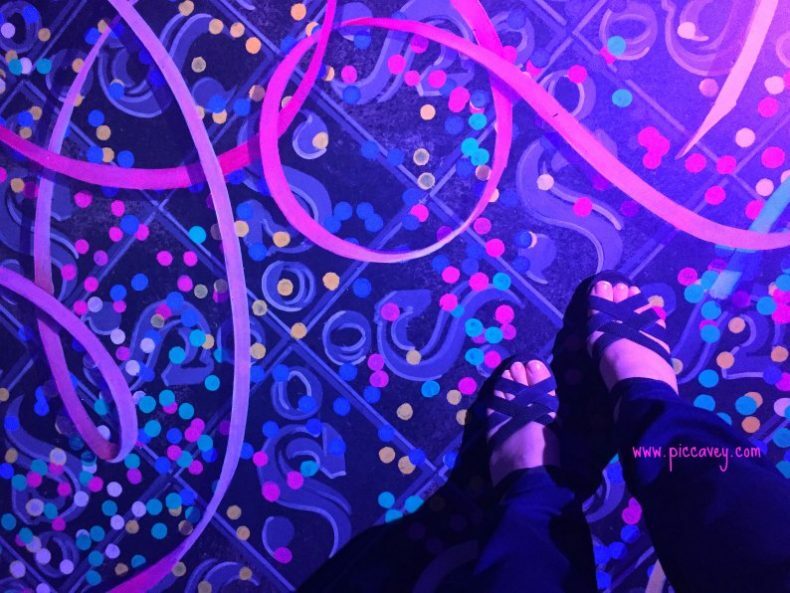 Love the way you’ve captured every detail of the experience, Molly! Spot on ?? Thanks, This comment means a lot. 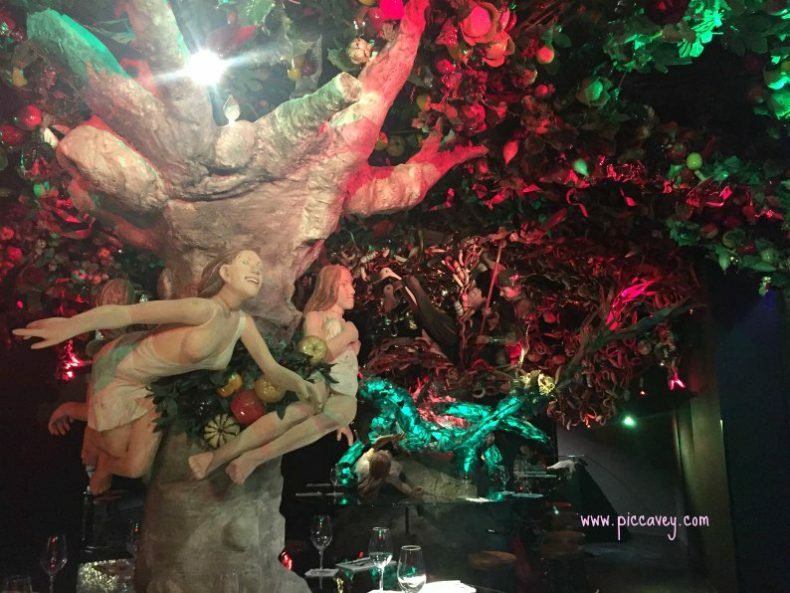 A difficult post to write… hard to recreate the magical atmosphere in words. Wow, it sounds fantastic! My favorite Catalan food is calçots – in the season I like to go to Can Borrell near Sant Cugat. Thanks for the Sant Cugat tip Dan!